Die Ideologie der NWO: Satanismus! : Sabbateans plotted the Armenian Holocaust! Business as usual is a powerful motivating force especially when Jews like the Rothschilds are running an oil business. 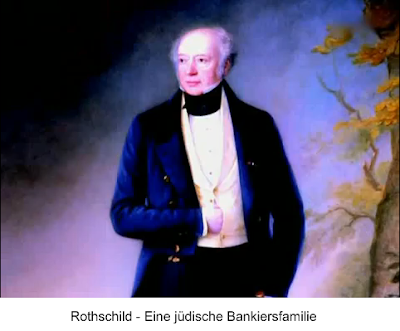 Banking is the forte of the Jewish House of Rothschild. But raw materials–especially oil–are money in the bank. Thus hand-picked Jews of Salonika, Jews made up the majority of the city’s population, and foreign agitators such as the Russian Zionist, Vladimir Jabotinksy, the editor of The Young Turk newspaper, were just what the Rothschilds needed for ridding the source of that instability, the Armenian Christians. Historical background of the Jewish "Young Turks"
1680: Sabbatai Zvi, a Turkish Jew, proclaims himself to be the Jewish Messiah in Salonica. After amassing a following of thousands of Jews - he led them on a Zionist exodus to Palestine. On the way he decided to become a Muslim. Many of his followers saw this as God's plan and also became Muslims. 1716: A group called the “Donmeh” forms in Salonica of Sabbatai Zvi’s followers headed by Sabbatai Zvi’s successor, Baruchya Russo. By the early 1900's, the Donmeh numbers in the hundreds of thousands. They were known as Crypto Jews because though outwardly appearing to be Muslims, they were still Jews following the customs of the Jewish occult Kabbala which Sabbatai Zvi taught. They continue in their fervent, (yet secret), Zionist vision. 1860: Jewish Hungarian Zionist named Arminius Vambery becomes an advisor to the Sultan Abdul Mecit while secretly working as an agent for Lord Palmerston of the British Foreign Office. Vambery tries to broker a deal between the Zionist leader Theodore Herzl and Sultan Abdul Mecit over the creation of Israel but fails. 1918: Jew Mustafa Kemal ‘Attaturk’ ascends into leadership. 1920: Russian Jewish Bolsheviks supply Attaturk iwth 10 million gold roubles, 45,000 rifles, and 300 machine guns with ammunition. 1921: Attaturk occupies the Port of Batu in conjunction with the Russian Jewish Bolsheviks ceding it to the Bolsheviks five days later. The Rothschilds are delighted. 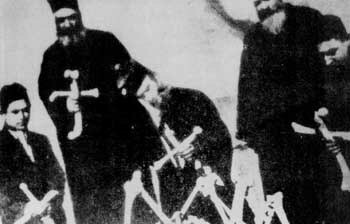 1922: Jewish Khemalists orchestrate the burning of Smyrna resulting in the ‘ethnic cleansing’ of over 100,000 Armenian and Greek Christians left tortured, starved, raped, and dead. The British Ambassador to the Ottoman Empire, Sir Gerald Lowther's letter to Sir Charles Harding, May 29 1910. Shortly after the revolution in July 1908, it soon became known that many of the Young Turks’ leading members were Freemasons. It was noticed that Jews of all colours, native and foreign, were enthusiastic supporters of the new dispensation, till, as many Turks expressed it, every Hebrew became a potential spy of the Young Turks. Turks began to remark that the movement was rather a Jewish than a Turkish Revolution. 1. Emmanuel Carraso: B’nai B’rith Official of Italian origin. Grand Master of the Macedonia Ressurected Masonic Lodge in Salonika; Established the ’secret’ Committee of Union & Progress in Salonika in 1890. 3. Djavid Bey: “Donmeh Jew.” Talaat’s Finance Minister; Arranged the finances of revolution in Turkey with the Rothschilds; Later assasinated by Attaturk as a perceived rival. 5. Refik Bey, AKA Refik Saydam Bey: Editor of Young Turk newpaper Revolutionary Press; Became Prime Minister of Turkey in 1939. 7. Vladimir Jabotinsky: Russian Zionist who moved to Turkey in 1908. Supported by B’nai Brith of London and Dutch Zionist millionaire, Jacob Kann; Editor of Young Turk newpaper. Later started the terrorist Irgun political party in Israel. 9. Mustafa Kemal ‘Attaturk’ (1881-1938): A Jew of Sephardic (Spanish) origin. Attaturk attended the Jewish elementary school known as Semsi Effendi School run by the Jew Simon Zvi. Over 12,000 Jews welcomed to Turkey by Attaturk in 1933 when Hitler came to power. Abe Foxman denies the Armenian Holocaust! For many years, the Anti Defamation League and now its director, Abraham Foxman, refuse to acknowledge that the massacres of 1.5 million Armenians between 1915 and 1923 constituted genocide. Jews simply can’t stand to share their so-called “martyred-race” status with anyone else. And besides, Jews don’t like to have their crimes pointed out to them. If one does, he is instantly labelled an “Anti Semite! Foxman has reiterated the ADL’s opposition to formal U.S. recognition of the Armenian Holocaust calling a proposed Congressional resolution a counterproductive diversion. This position is inconsistent with the ADL's mission statement to secure justice and fair treatment to all citizens alike. 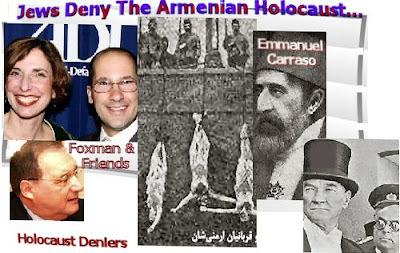 It is Foxman and the rest of the Jewish censors who should be thrown in jail for denying the Armenian Holocaust! Why do Jews abide by a double standard constantly? Aren’t we all sick of it and all these Jews for that matter by now? I for one, Brother Nathanael Kapner, a former Jew and now an Orthodox Christian, will do all in my power to expose the Jews. For the Jews are not innocent victims of persecution against them but have prompted backlashes against them throughout their “wandering-among-the-nations” history. The Jews in fact are the most fierce perpetrators of racist crimes the world has ever known, and the Armenian Holocaust of which the Jews are responsible is a clear example of their Jewish racist crimes. 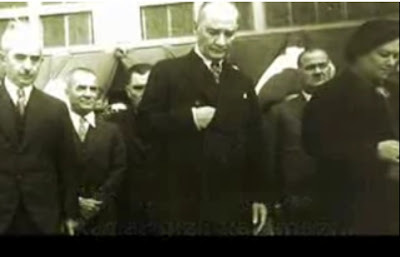 Kemal Pascha AtaTürk with thee "hidden hand! During the last quarter of the 19th century, the Near East Question passed into its critical phase. As a result of the Russo-Turkish war of 1877-78, the Ottoman Empire lost extensive territory mainly in the Balkans where the "autonomous" states of Bulgaria, Bosnia, and Herzegovina passed into the de facto administrative sphere of the Austro-Hungarian Empire. Thessaly and the prefecture of Artas were ceded to Greece, and in Asia, Russia annexed the territories of Kars and Ardachan in Turkish Armenia. In Africa, the English claimed Egypt, and the French Tunisia, while the Italians did not bother to conceal their territorial ambitions toward Tripoli. Meanwhile, the dissident movements in Crete, Armenia, and Macedonia were beginning to reach worrisome levels for the Turkish Sultanate. One of the first real threats to the Ottoman Throne was a hard-core, conspiratorial group that formed in 1889 among the students of the Military Medical School in Constantinople. The dissatisfaction, though, was widespread throughout the entire military, and had to do with what might be considered today to be union demands: low wages that were paid sporadically and after months of waiting, a promotion system that was torturously slow and not based on merit but on connections, and a cynical disappointment engendered by the promised but never actualized modernization of the military. The main motivating factor in the ever-widening discontent, however, was an agony and concern over the independence of the Turkish State and how best to ensure its continuance. Added to this, and of equal concern, was the problem having to do with the welfare and perpetuation of the Muslim populations living among the many other ethnicities within the Empire. The conspiratorial leadership, who came to be known as the Young Turks, expressed their dissatisfaction with the status quo, throwing all of the blame on the Sultan, Abdul Hamit, who they proclaimed to be too dictatorial. They demanded his exile -- though not the abolishment of the Sultanate -- together with the restoration of the constitution of 1876. The Young Turk movement -- after many mishaps and near dissolution -- finally achieved it first goal. In early July of 1908, led by the officer-members of the Committee of Union and Progress (Itihàt vè Terakì), the Turkish troops stationed in Macedonia refused to obey orders coming from Constantinople. 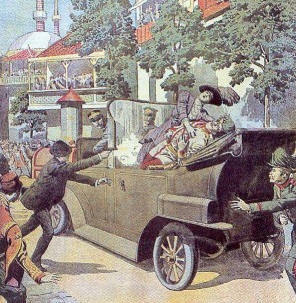 The Young Turks then sent a telegraphed ultimatum to the Sultan from Serres on the 21st of July. They demanded the immediate restoration and implementation of the constitution, and threatened him with dethronement should he fail to comply. On the 24th of July, Abdul Hamit announced that the constitution had been restored and was in full force and effect. The subsequent mid-20th century overthrow of King Farouk in Egypt by the Nasserite revolutionaries bears some striking similarities to the Young Turk movement. There are, however, some very striking differences as well. Some of these are: 1) the diverse ethnic background of the conspirators; 2) the significant and crucial role played by the allied movement of fellow-conspirators known as the Donmè (Jews who had converted [?] to Islam); and, 3) the enthusiastic way in which the conspiracy was embraced by Masonic elements. As far as the multiethnic composition of the conspirators is concerned, one need only read their names to verify their diverse background: Tserkès (Circassion ), Mehmet Ali, Xersekli (Herzogovinians), Ali Roushdi, Kosovali (Kosovars) and others. In many cases, the ethnic origin of the conspirator was not evident from the name: Ibrahim Temo was an Albanian, as was Ismail Kemal. Murat Bey Dagestanos and Achmet Riza had an Arkhazian father and an Austrian mother. One of the theoreticians of the movement was Ziyia Ngiokali, a Kurd, while one of the major planners of tactics and theory was a Jew from Serres who went by the name of Tekìn Alì (real name, Moshe Cohen). The telegraph-office clerk who became one of the ruling troika of post-revolutionary Turkey, Talaàt Pasha, was Bosnian, Pomack, or Gypsy; the point being that he was not a Turk. We should also make note of the fact that the Committee of Union and Progress admitted many members from areas outside of the Ottoman Empire, and that some of these even served on its Central Committee. The strong connection between the Itihàts (conspirators) and Masonry is a well-documented fact. The leftist Turkish writer, Kamouran Mberik Xartboutlou, in his book, The Turkish Impasse ( from the Greek translation of the French publication of 1974. p.24), wrote: "Those who desired entry into the inner circle of that secret organization [the Itihàt], had to be a Mason, and had to have the backing of a large segment of the commercial class." The true nature of the relationship between the Young Turks and the Masonic lodges of Thessaloniki has been commented upon by many researchers and writers. In her well-known and extensively documented book, Secret Societies and Subversive Movements (London. 1928, p. 284), author and historian Nesta Webster writes that "The Young Turk movement began in the Masonic lodges of Thessaloniki under the direct supervision of the Grand Orient Lodge of Italy, which later shared in the success of Mustapha Kemal." Of course, the precise nature of this relationship is clouded in mystery, but enough facts exist allowing for more than just informed conjecture based on circumstantial evidence. An example of the Itihàt-Masonic connection is the interview that Young Turk, Refik Bey, gave to the Paris newspaper Le Temps, on the 20th of August 1908: "It's true that we receive support from Freemasonry and especially from Italian Masonry. The two Italian lodges [of Thessaloniki] -- Macedonia Risorta and Labor et Lux -- have provided invaluable services and have been a refuge for us. We meet there as fellow Masons, because it is a fact that many of us are Masons, but more importantly we meet so that we can better organize ourselves." The Donmè ("convert" in Turkish), was a Hebrew heresy whose followers converted [?] to Islam in the 18th century. They were most heavily concentrated in Thessaloniki. According to the Great Hellenic Encyclopedia [Megali Elliniki Enkiklopethia]: "It is generally accepted that the Donmè secretly continue to adhere to the Hebrew religion and don't allow their kind to intermarry with the Muslims." The disproportionate power and influence (in light of their number) that the Donmè had on both the Ottoman Empire and on the Young Turk movement has been the subject of a great deal of commentary by many observers and researchers. The eminent British historian, R. Seton Watson, in his book, The Rise of Nationality in the Balkans. London, 1917 (H Gennisi tou Ethnikismou sta Valkania), wrote the following: "The real brains behind the [Itihàt] movement were Jews or Islamic-Jews. The wealthy Donmè and Jews of Thessaloniki supported [the Young Turks] economically, and their fellow Jewish capitalists in Vienna and Berlin -- as well as in Budapest and possibly Paris and London -- supported them financially as well. In the January 23rd, 1914, issue of the Czarist Police [Okrana] Ledger (Number 16609), directed to the Ministry of the Exterior in Saint Petersburg, we read: "A pan-Islamic convention of Itihàts and Jews was held in the Nouri Osman lodge in Constantinople. It was attended by approximately 700 prominent Itihàts and Jews, including "Minister" Talaàt Bey, Bentri Bey, Mbekri Bey, and (Donmè) Javit Bey. Among the many Jews in attendance, two of the most prominent were the Head of the Security Service, Samouel Effendi, and the Vice-Administrator of the Police, Abraham Bey." The numerous Donmè in positions of authority within the machinery of the Itihàt government, as well as on the powerful Central Committee, strengthens the conviction that their influence was widespread and vital to the cause. Ignoring the names mentioned in the Czarist Police Ledger, and even ignoring such Jews as the fanatical Pan-Turkic [Marxist revolutionary and poet, Hikmet] Nazim, or even the many casual allusions [as if it were common knowledge at the time] to the Jewish descent of that most dedicated believer in the Young Turk movement, Mustapha Kemal "Atatürk," one still finds oneself wondering by what authority and under whose auspices was such an obscure Jewish Donmè from Thessaloniki, by the name of Emmanouel Karasso, able to become a member of the three-man committee that announced his dethronement to Sultan Abdul Hamit after the counter-coup of April 1909? Compelling, too, is the widely-referenced document which states that Constantine, the King of Greece at the time, characterized the entire Young Turk movement as composed of "Israelites." According to the facts presented in her book, Glory and Partisanship, the Greek professor of the University of Vienna, Polychroni Enepekithi, contends that Constantine made that characterization while complaining to the German Ambassador in Athens about the outrages committed by Young Turks against Hellenes living in the Ottoman Empire. These references to the relationship between the Donmè, the Masons, and the Young Turks has not been prompted by anti-Semitism or Masonophobia. Rather, we are attempting to shed some light on what to us seems like a puzzling paradox in this revolutionary movement, which is: Why it is that this non-Turkish leadership struggled so hard under the banner of justice for the Turkish people? Also, why is it that others, having nothing to do with Sunnite Islam [the form of Islam practiced in Turkey] struggled equally hard under the banner of justice for Islam? The only answer to this paradox demands that we consider that there may have been another reason behind their fervid struggle, and that this unstated cause is what bound these "ideologues" together. Source Nemesis. by Ioasif Kassesian. September 2001. pp. 64-66.Translated by staff. Emphasis added. Were the plans of the 1915-23 Armenian Genocide actually drawn up and were in place by the year 1910 or 1912? According to some sources, definitely yes. There is the book Inner Folds of the Ottoman Revolution written by Mevlan Zadeh Rifat and published in 1929, the author, a pro-sultan Turk, claims that the "Armenian genocide was decided in August 1910 and October 1911, by a Young Turk committee composed entirely of displaced Balkan Jews in the format of a syncretist Jewish-Muslim sect which included Talaat, Enver, Behaeddin Shakir, Jemal, and Nizam posting as Muslims. It met in the Rothschild-funded Grand Orient loge/hotel of Salonika." Syncretism means a combination of different forms of belief or practice; masonism fits that description. A 1994 conference paper/lecture by Joseph Brewda of Schiller Institute entitled Palmerson launches Young Turks to permanently control Middle East claims the founder of the Young Turks to be a certain Jew by the name of Emmanuel Carasso. He states: "Carasso set up the Young Turk secret society in the 1890s in Salonika, then part of Turkey, and now part of Greece. Carasso was also the grand master of an Italian masonic lodge there, called 'Macedonia Resurrected.' The lodge was the headquarters of the Young Turks, and all the top Young Turk leadership were members." Further on Mr. Brewda says: "During the Young Turk regime, Carasso continued to play a leading role. He met with the sultan, to tell him that he was overthrown. He was in charge of putting the sultan under house arrest. He ran the Young Turk intelligence network in the Balkans. And he was in charge of all food supplies in the empire during World War I." It is ironic that five centuries after the Turkish sultans welcomed the expelled European Jews into Turkey, certain Jews belonging to secret societies and to Zionism will kick the sultans out of power early in 20th century, destroy the Ottoman Empire, and celebrate their victory by massacring by proxy almost the whole Christian Armenian people, one million and half Armenians; half million Greeks; and half million Christian Assyrians & Arameans. Mr. Brewda writes: "Another important area was the press. While in power, the Young Turks ran several newspapers, including 'The Young Turk,' whose editor was none other than the Russian Zionist leader Vladimir Jabotinsky. Jabotinsky had been educated as a young man in Italy." Mr. Brewda also mentions the novel Greenmantle, whose hero is a British spy who led the Young Turks, and that the book's author, John Buchan, later identified the novel's hero as the English nobleman Aubrey Herbert, who was the top British spy master in the Middle East during WW I. And that Lawrence of Arabia later identified Herbert as having been, at one time, the head of the Young Turks. According to Mr. Brewda, Carasso also appears in that novel under the name Carusso. By 1916 the British and French, overpowered by greed, already had a secret agreement to divide the Ottoman Empire between themselves. Presently Hitler's Mien Kempt anti-semitic book is a best-seller in Turkey, it is published by various Turkish publishers by the thousands and thousands. Are the Turks finally waking up and realizing that their Sultan's refusal to grant Palestine to the Zionist Jews as a homeland had cost them their centuries- old empire? Talaat was a living witness to the Genocide and history. He should not have been assassinated. His silencing for good by hot-tempered Armenians only served those who planned and executed the Genocide. Had he been left alone, who knows he might have confessed everything at his old age or at his deathbed. Another conspiratorial source is the lengthy article The Armenian & Jewish Genocide Project: Eliminating Ethnic Conflict Along the Oil Route From Baku to the Suez Canal Region written by Clifford Shack and posted in his web-site. Solomon Rothschild with the "hidden hand"
Further on Mr. Shack makes his point: "The decision by the shrewd French Rothschild branch to diversify into other areas of oil exploitation was, presumably, a calculated one. Three years after they joined Royal Dutch, production at Baku would come to an abrupt halt in 1905. Although shaken by political activity, the principal disruption was due to the violence of the ethnic conflict between the region's Muslims and the minority population of Armenians who are Christians. This ethnic conflict caused the first interruption of oil distribution to the world market. Standard oil was quick to supplant the needs of the effected markets as its source was operating under the blanket of peace. The Royal/Dutch/Shell Group (and the Nobles) watched their Baku investments go up in flames. Ethnic conflict was at the root of the matter. It could be safely assumed that they were taking measures to eliminate the possibility of that happening in the future." Oil corporations seem to have learned their lessons from history because before the construction of present-day Baku-Ceyhan pipeline has began, someone has made sure that no Armenians were left in Baku anymore. Although the Armenian threat to that pipeline has been neutralized, yet there is still A Turkish ultra-nationalist revival threat, and a threat from Iran if Iran comes under attack from USA or Israel. There is a very clean prophecy of Nostradamus stating: "By firepower of armies, not far from the Black Sea, he will come from Persia/Iran to occupy Trebizond." Trebizond is located at the shore of the Black Sea and its occupation will virtually cut the Baku-Tbilisi-Ceyhan pipeline in half. Another prophecy of Nostradamus reads: "Toward Persia/Iran a sizable army of a million. The serpent Satan invading Byzantium and Egypt." Byzantium & Egypt could be a mystical name for modern Istanbul as Sodom & Egypt is the mystical name given for Jerusalem in the book Revelation 11:8. Mr. Shack notes that "the mere elimination of the Armenian population of Baku would not solve the problem of ethnic conflict in that region. The surrounding areas would provide reservoir effect in resupplying the conflicting minority element." And he asks: "was the removal [in 1915-23] of a small minority like the Armenians [from historical Armenia] a fair price to pay for the peace in a region so crucial to the development and investment of the Far East?" Apparently Mr. Shack ignores the factor of revenge raging in the heart of human beasts. The fool said in his ignorance, "There was no planned and organized and executed genocide of the Armenians." In chapter 30 of the book of Isaiah, we read God speaking by His prophet: "Woe to the rebellious children, who execute a plan, but not Mine, and make an alliance, but not of My Spirit, in order to add sin to sin;...For this is a rebellious people, false sons, sons who refuse to listen to the instruction of the Lord." Kemal Pascha AtaTürk with the "hidden hand! Chorus: It is clear that the B'nai B'rith is an abject tool of British intelligence, run and directed to serve the interests of British imperial policy, and not the interests of Jews, nor even of B'nai B'rith members. The one peculiarity of B'nai B'rith in comparison to the other organizations launched by Palmerston and his three stooges, is that B'nai B'rith will be used for a wider variety of tasks in various countries and epochs. Therefore, the B'nai B'rith will be more permanent in its continuous organization than its Mazzinian counterparts, among which it stands out as the most specialized. At the end of this century, one of the tasks assigned to the B'nai B'rith will be to direct, with the help of other Mazzinian agents, the dismemberment and partition of the Ottoman Empire. This is the state the British will call "the sick man of Europe." Historically, the Ottoman Empire offers surprising tolerance to its ethnic minorities. In order to blow up the empire, that will have to be changed into brutal racial oppression on the Mazzini model. In 1862, during the time of the American Civil War, Mazzini will call on all his agents anywhere near Russia to foment revolt as a way of causing trouble for Alexander II. A bit later, with the help of Young Poland, Mazzini will start a Young Ottoman movement out of an Adam Smith translation project in Paris. In 1876, the Young Ottomans will briefly seize power in Constantinople. They will end a debt moratorium, pay off the British, declare free trade, and bring in Anglo-French bankers. They will be quickly overthrown; but the same network will soon make a comeback as the Young Turks, whose rule will finally destroy the Ottoman Empire. In 1908, the Committee for Union and Progress, better known as the Young Turks, carried out a military coup, overthrew the sultan, and took power in the Ottoman Turkish empire. Once in power, they carried out a racist campaign of suppressing all non-Turkish minorities. Within four years, their anti-minority campaigns provoked the Balkan wars of 1912-13, among Turkey, Greece, Bulgaria, and Serbia. By 1914, these wars had triggered World War I, with Turkey becoming an ally of Germany. Within seven years of coming into power, the Young Turks destroyed the Ottoman Empire. British intelligence had manipulated every nationalist group in the Empire, both the Young Turks, and their opponents. When the Young Turks took power, the Ottoman Empire still included Syria, Iraq, Jordan, Palestine, and the Arabian Peninsula. The empire still included much of the Balkans: half of Greece, half of Bulgaria, half of Serbia, and all of Albania. Its land area was much bigger than present-day Turkey. Although most of the population of the Ottoman empire were Turks, there were also large numbers of Slavs, Greeks, Arabs, Armenians, and Kurds. The Ottoman empire was a multi-ethnic empire, as were the nearby Austrian and Russian empires. The Young Turks came to power waving the banner of democracy, but they soon picked up the banner of pan-Turkism. The idea was to form a state that included all the Turkic peoples of Asia. Since half of these people lived in Russia, this policy meant a collision with Russia. But pan-Turkism was not created by the Young Turks or even in Turkey. It was first called for in the 1860s by a Hungarian Zionist named Arminius Vambery, who had become an adviser to the sultan, but who secretly worked for Lord Palmerston and the British Foreign Office. Vambery later tried to broker a deal between the Zionist leader Theodor Herzl and the sultan, over the creation of Israel. The Young Turks also raised the banner of a pan-Islamic state. The idea was to bring all the Muslim peoples of the world into one empire, whether or not they were Turkish. This was another goal that meant conflict with Russia. This idea was also not created by the Young Turks or in Turkey. It was first called for in the 1870s by an English nobleman named Wilfred Blunt, whose family had created the Bank of England. Blunt was a top British intelligence official who advocated using Islam to destroy Russia. Blunt's family later patronized the British KGB spy "Kim" Philby. While the Young Turks were pushing the pan-Turkic and pan-Islamic movements, the British were also boosting all the anti-Turkish independence movements within the empire. They were supporting Arab nationalism, led by Lawrence of Arabia. They were supporting Serbian nationalism, led by the British agent Seton-Watson; Albanian nationalism, led by Lady Dunham; and Bulgarian nationalism, led by Noel Buxton. All of these peoples wanted to break free from the Ottoman Empire; but they also claimed the land of their neighbors. For example, the British supported the idea of carving a "Greater Armenia" out of Turkey, Iran, and Russia. This "Greater Armenia" had no possibility of existing. None of the Great Powers, including Britain, really wanted it. The Kurds, who lived in the same area, didn't want it. But the British told the Armenians they supported their plans. At the same time, the British were also telling the Kurds they supported the idea of "Greater Kurdistan." As the map shows, the proposed territories of "Greater Kurdistan" and "Greater Armenia" were almost identical. In 1915, during World War I, the Kurds killed about 1 million Armenians (Photos). 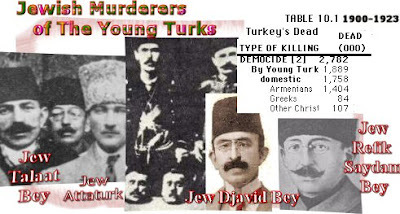 The Young Turks, who had been put in power by the British, used the Kurds (who thought they had the support of the British) to slaughter the Armenians (who also thought they had the support of the British). The British then used this genocide as a justification for trying to eliminate Turkey. In fact, the next year, the British and French got together to plan the division of the Ottoman Empire between themselves. According to the plan, which only partially worked, Turkey itself would be reduced to a tiny area on the Black Sea. The rest of the empire would go to Britain and France. But who were these "Young Turks," who so efficiently destroyed the empire? The founder of the Young Turks was an Italian B'nai B'rith official named Emmanuel Carasso. Carasso set up the Young Turk secret society in the 1890s in Salonika, then part of Turkey, and now part of Greece. Carasso was also the grand master of an Italian masonic lodge there, called "Macedonia Resurrected." The lodge was the headquarters of the Young Turks, and all the top Young Turk leadership were members. The Italian masonic lodges in the Ottoman Empire had been set up by a follower of Giuseppe Mazzini (vgl: Schriftwechsel zwischen Mafiagründer Mazzini und Klu-Klux-Klan-Gründer Albert Pike: Mit drei Weltkriegen zur Weltmacht!) named Emmanuel Veneziano, who was also a leader of B'nai B'rith's European affiliate, the Universal Israelite Alliance. During the Young Turk regime, Carasso continued to play a leading role. He met with the sultan, to tell him that he was overthrown. He was in charge of putting the sultan under house arrest. He ran the Young Turk intelligence network in the Balkans. And he was in charge of all food supplies in the empire during World War I. Of course, there were also some Turks who helped lead the Young Turk movement. For example, Talaat Pasha. Talaat was the interior minister and dictator of the regime during World War I. He had been a member of Carasso's Italian masonic lodge in Salonika. One year prior to the 1908 coup, Talaat became the grand master of the Scottish Rite Masons in the Ottoman Empire. If you go to the Scottish Rite headquarters in Washington, D.C., you can find that most of the Young Turk leaders were officials in the Scottish Rite. But who founded the Scottish Rite in Turkey? One of the founders was the grand master of the Scottish Rite in France, Adolph Cremieux, who also happened to be the head of the B'nai B'rith's European affiliate. Cremieux had been a leader of Mazzini's Young France, and helped put the British stooge Napoleon III into power. You can find the story of the Young Turks in the B'nai B'rith and Scottish Rite archives, but you cannot find it in history books. The best public account is found in the novel Greenmantle, whose hero is a British spy who led the Young Turks. Carasso appears in the novel under the name Carusso. The author, John Buchan, who was a British intelligence official in World War I, later identified the novel's hero as Aubrey Herbert. In real life, Herbert was from one of the most powerful noble families in England. The family held no fewer than four earldoms. His repeated contact with Carasso and other Young Turk leaders is a matter of public record. Herbert's grandfather had been a patron of Mazzini and died leading revolutionary mobs in Italy in 1848. His father was in charge of British Masonry in the 1880s and 1890s. His uncle was the British ambassador to the United States. During World War I, Herbert was the top British spymaster in the Middle East. Lawrence of Arabia later identified Herbert as having been, at one time, the head of the Young Turks. The U.S. State Department also played a role in the conspiracy. From 1890 through World War I, there were three U.S. ambassadors to Turkey: Oscar Straus, Abraham Elkin, and Henry Morgenthau. All three were friends of Simon Wolf. And all three were officials of B'nai B'rith. Two years ago went to a Jewish holocaust memorial center in London, and for the first time (shame) I have head a speaker talking about Armenian People Tragedy. I was confused and people of jewish rligion felt, in my observation,unconfortable with this NICE Armenian man speach. 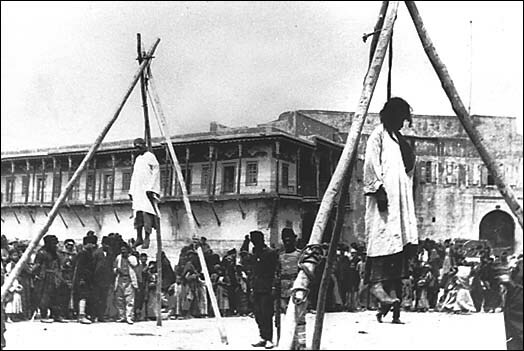 This was first the time I realised that Armenian People were slaughter by some people of the jewish religion. Also, english are always third party in every one masacre on this planet!!! To me was shocking ralisation. And by reading suppressed truth that rearly anybody knows, on this site, I feel sad.